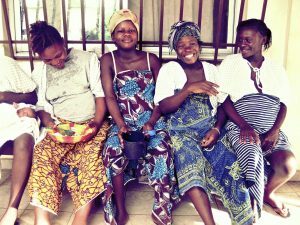 Mothers waiting outside a clinic in Sierra Leone. As human beings, we are drawn to the subject of death as it is an event one day we will all face. However, one circumstance we rarely link with death is childbirth. In the twenty-first century, maternal mortality is at an all-time low and hardly ever occurs in the United States, or so many of us thought. Although the maternal mortality rate in the United States is relatively low at 14 deaths for every 100,000 live births according to the CIA World Factbook 1, there still needs to be a conversation about reducing maternal mortality even further. Especially in countries such as Sierra Leone where the maternal mortality rate is 1,360 deaths per 100,000 live births in 2015. That is by far the highest maternal mortality rate for any country in the world. But why is it so high? 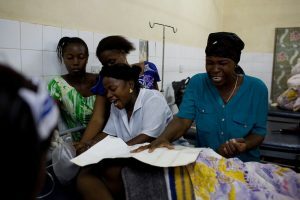 Relief Web states that in 2016 there were 706 reported maternal mortality deaths in Sierra Leone and that it is questionable whether this figure is accurate or if the number is much higher 2. Taking a closer look at Sierra Leone one cause is of this health care crisis is clear; there is a shortage of access to care as well as supplies. 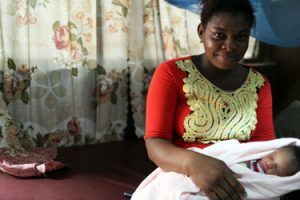 UNICEF3 has found that many mothers in rural areas of Sierra Leone have an opportunity to see trained health care professionals due to their scarcity. Some never even seek out help and continue to see traditional birth attends who do not have medical or training. When this women in rural areas do not seek proper care by the time it is realized that the mother is in danger it is already too late. A family says goodbye after their loved one passed away due to post-partum hemorrhaging. The birth attendants do not have adequate training and equipment, and the closest doctor could be hours away. In many cases post-partum hemorrhaging that is more than survivable if caught early in the US becomes a death sentence for these women. In addition to seeking health last minute not many women find care throughout their pregnancy which creates a potential risk of missing preexisting conditions and makes it impossible to monitor the mother. With severe outbreaks such as the Ebola virus protecting soon to be moms is impossible. UNICEF is making many strides to address this healthcare crisis. With capital from the European Union, UNICEF has been supporting five doctors, gynecologists, and obstetricians in Sierra Leone. Plans have been moving forward to distribute care more effectively by creating five emergency birthing units and one comprehensive care center in each of the 14 districts of Sierra Leone. Proposals for a free healthcare initiative have also been in the works which would include the distribution of supplies to mothers of children under the age of 5. Zainab Turay holds here son after visiting George Brook Community Health Centre throughout her pregnancy. 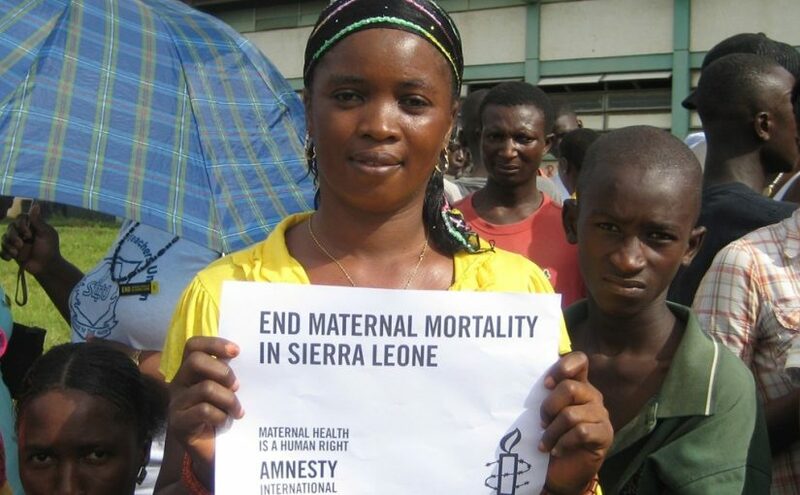 At this point, you might be asking yourself “what can I do?” One simple thing you can do is to raise awareness about the maternal mortality crisis on Sierra Leone. Women all around the globe deserve to have accessible maternal health care and to bring their children into the world without fear. Just by starting the conversation you can help take the step in the right direction. Previous Previous post: Food Security: GMOs, Changing the Future of Farming.